Note that test accounts will be removed every week. Unlimited site customization with unlimited use of colors, fonts, spacing, buttons, blocks, parallax sections, Video Hero background, galleries, menus and many more components. All is customizable in a few clicks and no coding skills required. All our code is WP Standards Friendly : No SQL crappy code and no greedy query for a top-notch PHP performance. Developpers friendly : Hundreds of Hooks, filters & actions to properly extend our themes, child themes & plugins. All our code is SEO Friendly. All our code is Fully translatable and WPML compatible. All changes in live edit with WordPress Customizer. No bloated page builder. Only use of WordPress Core-features like Pages, Widgets & Menus : No time to learn how the page builder works (or not…) ! Customized widgets created especially for a direct implementation. 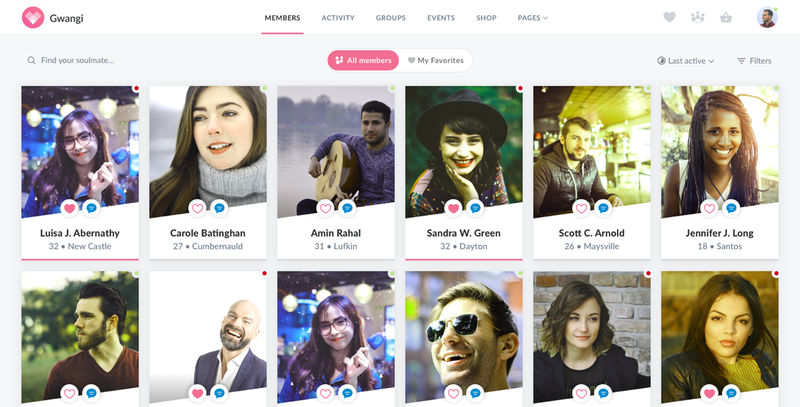 BuddyPress power unleashed with a beautiful re-designed UX like members directory, groups directory, site-wide Activities listing & many other views. 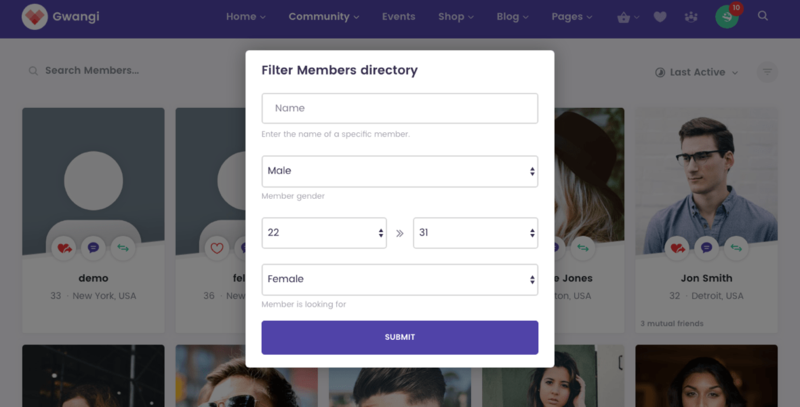 Creation of custom members directory with filters based on custom members profile fields (Birthday, Towns & Country fields already included!). Site-wide Global Search in AJAX with sorted & accurate results. Matchmaking directly on profile & members directory. 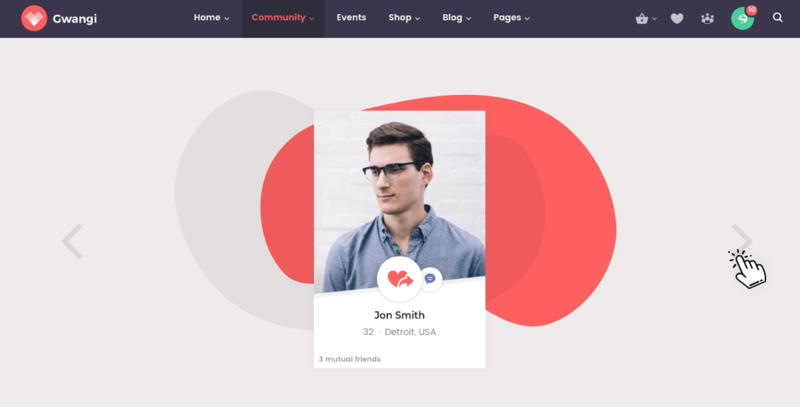 Members Swap view : Browse members like Tinder. Mutual friends display on profile & members directory : Increase your community’s connection. 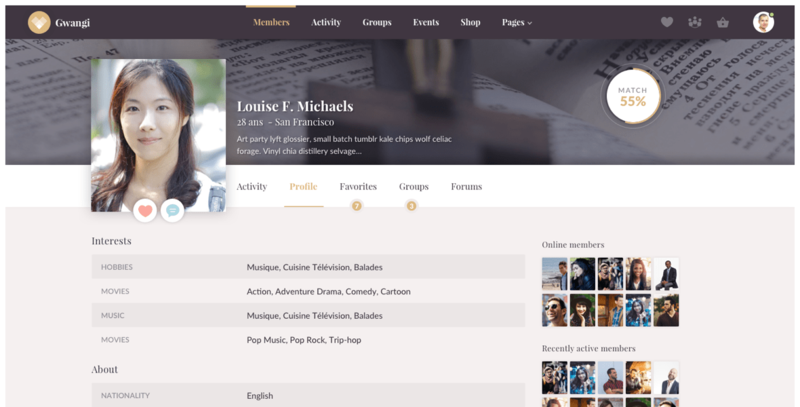 Members can upload media to their profile, profile of their groups, and all activity streams. Members can create blog posts + Admin moderation. Beautiful & redesigned BBPress forums views with statistics & Users posts count. Sign-in via AJAX + Complete & user-friendly registration based on custom fields. Beautiful Community Store with WooCommerce filters based on custom categories, tags & products attributes. Monetize your Platform : manage the subscriptions and payment ecosystem of your platform with WooCommerce & WooCommerce Subscriptions (sold separately). Great e-commerce experience with features like Infinite scrolling, Product Quick View, Wishlist & Direct Product Image flipper on hover. Create awesome events with powerful features of The Events Calendar like recurring events, organizers and venues. 7 layouts of Events like Masonry grid, list, calendar or Map view. Sell tickets to future participants with The Events Calendar Tickets Plus (sold separately). Import your events from Facebook, Meetup, Google Calendar, iCalendar & many others with The Events Calendar (sold separately). Add ads to your site with AdRotate Banner Manager. 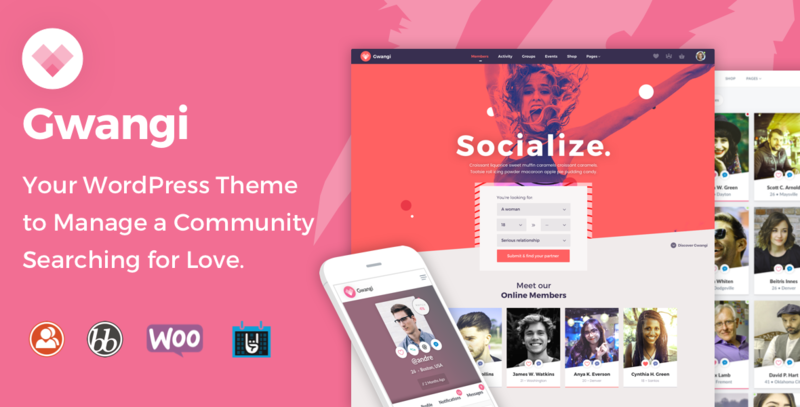 Best WP plugin to build a community. Create premium content sites, clubs/associations, subscription products and more! The plugin adds a new revenue source to your site. Allow users to upload images, media, music and organize all their medias. Custom members directory and search filter. BP custom field for member location. AJAX replacement for standard BuddyPress Messages. Follow members on your BuddyPress. Allows members to “poke” other members. Create & Sell Courses, Deliver Quizzes and Award Certificates by Using LearnDash the Most Trusted WordPress LMS. Display author post count on forum. AJAX login & password reset. Image field for menu items. Advanced features for events (sold separately). 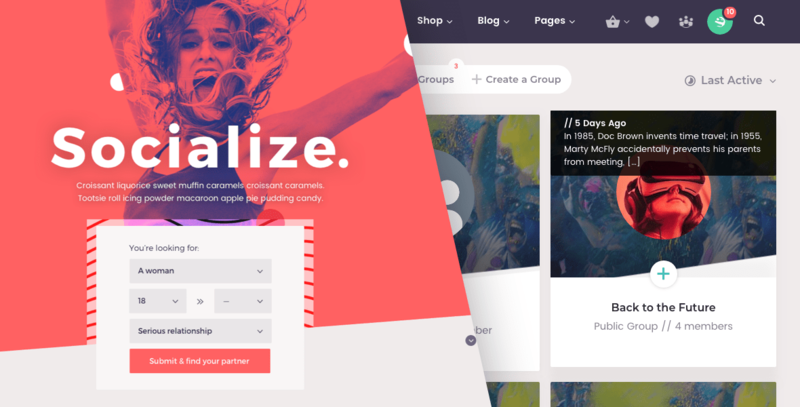 Sell tickets for your events in partnership with WooCommerce (sold separately). E-commerce, sell your products online. Capture More Residual Revenue with Recurring Payments (sold separately). Restricting your site’s content (sold separately). Switch image on hover for WC archive. ”+/-” input for product quantity. Infinite scrolling for WC archive. Quick view on each WC product. Allow users to add products to their whishlist. Add unlimited sidebars in unlimited context. Allow users to subscribe to your newsletter. 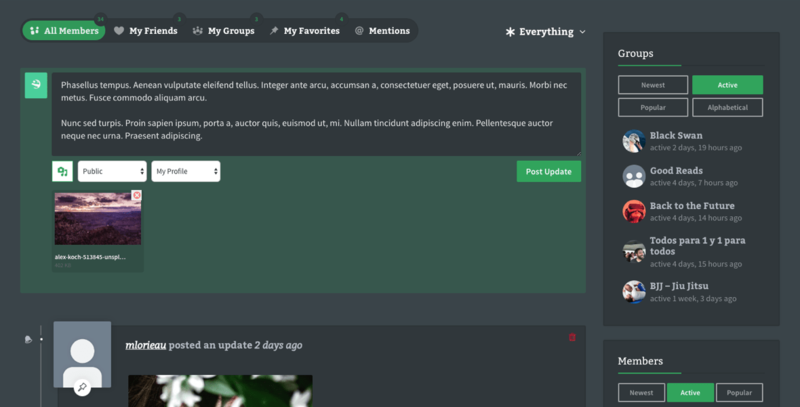 Show/hide menu items based on BuddyPress roles and capabilities. Display your instagram feed anywhere. Swiss knife for your site, galleries, carousel, site stats, etc.. Create unlimitted sliders and animated banners (sold separately). Manage the SEO of your site. Component library to provide you with a ton of options in the WP customizer. All our themes and plugins are handcrafted using WordPress coding standards. So any plugin should be compatible ;D.
Customer service is one of our top priority. Don’t hesitate to contact us. FIXED: Fix WooCommerce templates (v3.6+). FIXED: Fix some warnings with BP xProfile Location plugin. FIXED: Fix scroll error in bbPress (thanks to @surrealer). FIXED: Fix page overflow on the directory (thanks to @pinark1911). FIXED: Some CSS issues - Related plugins: BBPress, BuddyPress, WooCommerce. NEW: New Customizer controls which allows you to choose and re-order the fields to display in the members directory and on users profiles. IMPROVEMENTS: Better compatibility with Community Tickets plugin. IMPROVEMENTS: Better compatibility with Community Events plugin. IMPROVEMENTS: Better compatibility with Community Events Tickets plugin. IMPROVEMENTS: Better compatibility with Paid Memberships Pro plugin. FIXED: Fix visibility of profile search form in some sidebars (thanks to @chilepower). FIXED: Fix members pagination on a group profile (thanks to @creation). FIXED: Fix visibility of hidden groups (thanks to @surrealer). FIXED: Fix Smooth Scrolling bug with The Events Calendar pagination (thanks to @eclub). FIXED: Fix the visibility of match percentage knob on user profile. FIXED: Fix bbPress header display on the BP profile page. FIXED: Fix page overflow bug on members directory with a mobile device (thanks to @pinark1911). FIXED: Fix the avatar step on create group screen (thanks to @chilepower). FIXED: Some CSS issues - Related plugins: The Events Calendar, BP Search Profile. FIXED: Some CSS issues - Related plugins: mutual buddies, Login with AJax, BBPress, WooCommerce. NEW: Added Ajax for Swap members views. No more page loading. REMOVE: Drop Lava Bp Post plugin compatibility. Use Social Articles instead.